La Trobe University has rolled out an innovative new app, web and phone based solution to manage parking payments and virtual permits, streamlining the parking process across its eight campuses. The new CellOPark system replaces the previous student permit parking system which was manual, paper-based, and inflexible. With CellOPark, Students and staff will no longer need to search for parking meters, exact change or lost tickets. Furthermore, motorists only ever pay for the exact parking time they require, helping to avoid needlessly overfeeding the meter. 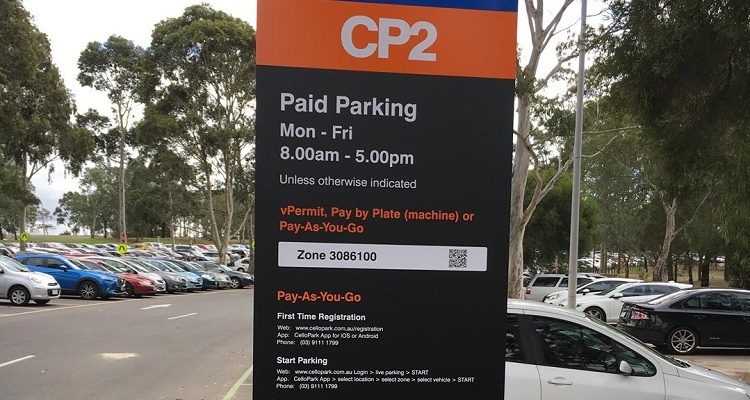 To cater for the University’s unique needs, the system also integrates a new virtual, self-managed permit system called ‘vPermit’, and physical ‘pay by plate’ machines to cater for one-off visitors to the University. Students and staff are able to simply install the free app (native on iOS and Android) on their smartphone and register their details. Starting a paid parking session is then as easy as selecting the parking zone and pressing ‘START’ or pointing the phone’s camera at a QR code on CellOPark zone signage. Michael Doherty, General Manager, CellOPark believes the rollout demonstrates La Trobe University’s commitment to innovation. Non-smartphone users can also enjoy the convenience of the CellOPark system by registering their details at www.cellopark.com.au. Following registration, users will have access to parking by calling (03) 9111 1799 and following the prompts. La Trobe motorists join over 100,000 members that already enjoy the benefits of CellOPark’s Pay-by-App, Pay-by-Phone and vPermit parking technology solutions. Established in Sydney in 2008, and based on a technology heritage dating back over 10 years, CellOPark is Australia’s leading provider of Pay-by-App, Pay-By-Phone and ePermit technology to the parking industry. Every day thousands of CellOPark members enjoy the convenience of using their mobile phone to pay for a car space rather than feeding coins or credit cards into a traditional parking meter. ‘Providing Options’ to motorists and parking providers, including smartphone and non-smartphone payment methods linked to debit cards, credit cards, unique CellOPark pre-paid cards, or PayPal top-ups, CellOPark tailors integrated Smarter Parking solutions using multiple technologies for municipalities, universities and private parking providers.